The finale of the Hypnotic collection from Cult Nails is Hynotize Me. Now originally, I just wasn't thrilled about this color - I didn't know exactly what it was from the bottle picture and I kept thinking "Meh." Boy, was I wrong. This color is like a CND Effect on steroids. 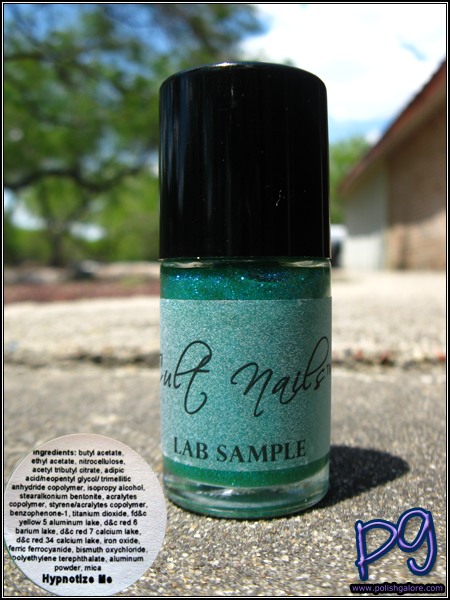 It's TONS of blue and green microglitter in a Granny Smith green apple jelly base. It's STUNNING on the nail. I put 2 coats on my nails but I probably could have been fine with 1 since there's so much going on in this polish. Index finger: Enigmatic; Middle finger: In A Trace; Ring finger: Awakening; Pinkie finger: bare. While this is a lab sample, again I believe this is very close or is the same as the actual color. Because this is a "thirsty" glitter, I put one coat of nubar Diamont over it, and the finish was smooth but without any top coat, the top of my nail felt a bit gritty. Hello blue baby! As you can see on the bare nail, it's that green jelly like base color. Moved the bottle to the side so you can see all that glitter! I really love the way this looks over both Awakening and Enigmatic. Indoors with the flash - check out how pretty it looks! In person you can see a shift from the green to the blue which doesn't quite capture on camera but it's super beautiful. If you're on the fence, don't be - get it! WOW! That is some serious bling! I love it!